If you’ve never had mildew in your carpet, you’ll know it when you smell it. That distinctly earthy smell is unmistakable, and if you start to detect it in the carpeting in your home, you’ll need to take action right away. Our carpet cleaning team in Casper has helped many homeowners in the area battle their carpet mildew problems, and we have tips to help you eliminate mildew as well as prevent it from happening in the first place. Where Does Carpet Mildew Come From? Mildew develops in carpeting primarily due to moisture. If your home has recently flooded or subject to other water damage, your carpet is at high-risk of developing mold and mildew. There are mold spores in the air at all times; if those spores find a nice damp and warm place to make a home, they are going to grow and spread. That place could be your carpeting or virtually any other surface. How Do I Prevent Carpet Mildew? Lower the humidity in your home. If you live in an area with high humidity, you might want to run a dehumidifier in your home to pull out some of that natural moisture. That’s not usually an issue for Casper residents, but if you’ve had water damage recently, it’s something you should also consider. Make sure carpets get completely dried. If you end up doing your carpet cleaning yourself (not something that is recommended for many reasons, not the least of which is voiding your warranty), you’ll want to make sure that the carpets get totally dry before you replace your furniture. Remove as much water from the carpeting as possible and then set up fans in the area to move lots of air around. Remember that even when the carpet is dry to the touch, the padding underneath will also need time to dry. Use a high-quality padding. A lot of carpet paddings today offer anti-mildew and antimicrobial properties that can help prevent mildew from forming in the first place. They might cost a little bit more in the beginning, but the hassle and headaches they can cause you down the road are well worth it. 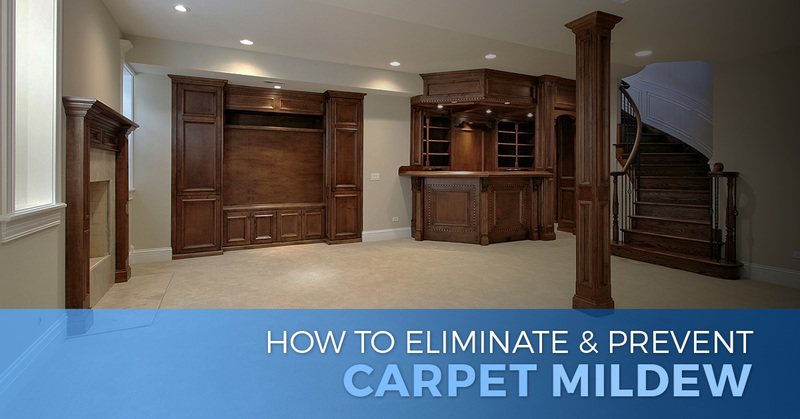 How Can I Eliminate Carpet Mildew? The best thing to do is hire a professional carpet cleaning company. Trying to remove the odor yourself can end up making it worse and potentially even damaging your carpets. You can start by thoroughly vacuuming the carpet, focusing on the area where you smell the mildew. You can also try a mixture of vinegar and baking soda on the affected area, allowing it to sit for a few hours and dry completely before you vacuum the area again. Typically, though, these efforts will result in only a temporary fix. 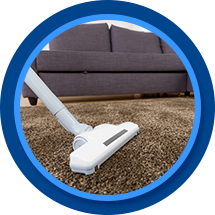 You will likely still need to call in the help of a professional team to get the carpeting and padding clean all the way down and to totally eliminate the smell. We’re ready to get to work on your carpets, too. Give us a call or contact us through the form on this website and we’ll get back with you right away to schedule your carpet-mildew removal services.